Flowing Hair Half Dollars - The second ever silver coins made by the U.S. Mint. 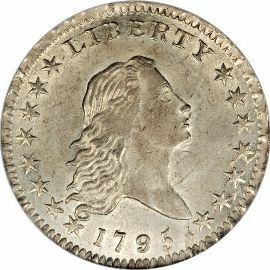 Flowing Hair Half Dollars were produced from 1794 to 1795. Some of the coins dated 1794 were actually made in 1795 due to the mints rolling equipment breaking down. 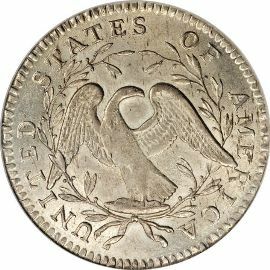 The mint could not flatten silver ingots in order to make coin blanks for these half dollars. However, the mint had several obverse dies with the 1794 date on them. Rather than scrapping these dies they used them in the coming year. When these dies wore out they began to use the ones dated 1795.
feature a young female figure facing to the right with flowing locks of hair behind her. The obverse also has the inscription LIBERTY above the portrait, 15 stars surrounding, and the date below it. The reverse of these half dollars shows a small eagle perched on a rock within a laurel wreath. the inscription UNITED STATES OF AMERICA.